I hep run things around here. We’re thrilled to announce that The Weekly Standard and The Washington Examiner podcasts will be joining the Ricochet Audio Network. The podcasts will also be available on our site and in the SuperFeed. MediaDC is excited to announce that we’re joining forces with Ricochet to bring the best conservative podcasts together on one platform. Conservative journalists and pundits like Steve Hayes, Byron York, Bill Kristol and Salena Zito will now be available on the same Ricochet platform as Peter Robinson, Rob Long, James Lileks, Mona Charen, Jonah Goldberg, Jay Nordlinger, John Podhoretz, and many more. 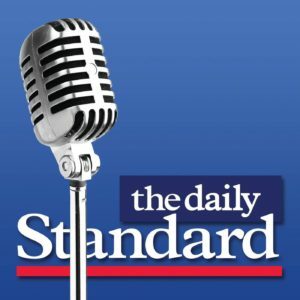 Beginning May 1st, The Weekly Standard’s The Daily Standard podcast and the Washington Examiner’s Examining Politics Daily will be available on the Ricochet Superfeed and on Ricochet.com, along with the popular pop-culture podcast, The Sub-Standard. Ricochet co-founder Rob Long says “We’re excited to add to the outstanding team at Ricochet the fresh reporting and keen insights of MediaDC journalists like Bill Kristol, Fred Barnes, Mike Warren, Byron York, and Salena Zito”. we couldn’t be more proud and honored to carry MediaDC’s shows. They’re doing some of the smartest, fast-moving, and entertaining audio-on-demand shows around. Ricochet co-founder Peter Robinson adds, “I share Rob Long’s enthusiasm for MediaDC and all its works–smart, fast-moving, and entertaining. “My mission at MediaDC is to take the terrific content being generated by the Washington Examiner and the Weekly Standard and get it into as many easy-to-use formats as possible,” says Creative Director Michael Graham. “When you think about depth of talent at the Washington Examiner from Jamie McIntyre covering the Pentagon to Sarah Westwood at the White House to Phil Klein on healthcare and Tim Carney on politics—using the best of that talent every day to create the “Examining Politics Daily” makes for terrific content. At the same time, “The Daily Standard” delivers a unique analysis of the events shaping the news and the world today – with an all-star roster of the best conservative thinkers like Bill Kristol, Steve Hayes, Fred Barnes, and others. Oh great, expanding our Neo-Con Inc. enterprise. I love it, Scott. I admire many of those folks and can’t wait to hear from them more often! Yes, more people that got everything wrong last election. Should be insightful. Are you picking up the Weekly SubStandard podcast too? Please, please, please, please, please!!!!! Awesome. I love the Substandard podcast. The press release said they were. Can we not litigate the election all over again? If you don’t like them, you don’t have to listen to them. So tell me, folks, who would you like them to invite as guests on their podcasts? How about people without the track record of getting all their predictions wrong. You know people that actually have a feel for what’s happening in this country. Bill Kristol interviewing David Horowitz would be interesting…. Good news. I just hope it doesn’t knock the Ricochet budget back into the red, if it ever escaped. To say “they get all their predictions wrong” is over the top. Okay, who would you like? Actually that would be interesting–and fun! Scott M Greer and people like him. Oh and they did get all their predictions wrong especially Bill Kristol and his ilk. I love Michael Graham and always enjoy his interviews. I will be glad to have all these podcasts together under the Ricochet banner. Now I just need more time to listen. I vote for a hostile takeover of the Panoply Network. You’re right, I missed it. Awesome. Now, Jim Geraghty would probably appreciate it if you’d pick up The Jim and Mickey Show too. Salena Zito is on that list. She got everything right. Add in Byron York, Michael Barone and Philip Klein. Ricochetti should prepare for The Substandard by viewing as much Mechagodzilla and Missy Peregrym as possible. I don’t know them, but I’m open to voices I haven’t heard, Robert. I’m not like it’s my decision or anything! Are all these going to appear on the main feed? If so, than that is all the main feed is going to be is podcasts. Going to have to do another shrink job and make the podcast items take up less vertical space. Forget Woods and Murphy as guests, Ricochet would gain tremendous intellectual breadth, entertainment value and bonhomie by featuring their podcasts. I don’t always agree with the opinions but I do listen to the Daily Standard podcast almost every day. I think this is a good thing. Substandard Podcast is great. Michael Graham is outstanding and very funny. Welcome guys! The Substandard is the best. I can’t believe they got Michael Caine to sit in for an interview this week! Even if you don’t care for many of the hosts of these new podcasts, odds are good that once in a while one of them will have a guest you are interested in listening to. It’s not all or nothing. I discovered Ricochet because I once saw that Jonah Goldberg was going to be a guest on a podcast that I could listen to for free. That brought me in, then I became a regular listener of The Ricochet Podcast and Rob’s pleading got me to purchase a membership. A LOT of current Ricochet subscribers describe similar scenarios. So even if you hate Bill Kristol’s guts, having these podcasts available through this outlet might net us a few new members, and unless Rob is just a panic-monger, Ricochet needs more subscribers to keep the lights on. True, but I would love to have one of them, or both, just demolish the Neo-Cons on their flagship podcast.